Since antiquity snow-covered peaks have been ignored, avoided or even feared by men - up here apparently there was nothing to be gained. But in search of adventure and knowledge during the 19th century mountains and glaciers became more and more visited by mountaineers, naturalists and even queens - and today the science of glaciers demonstrate urgently how the climate and our interference is changing the world. 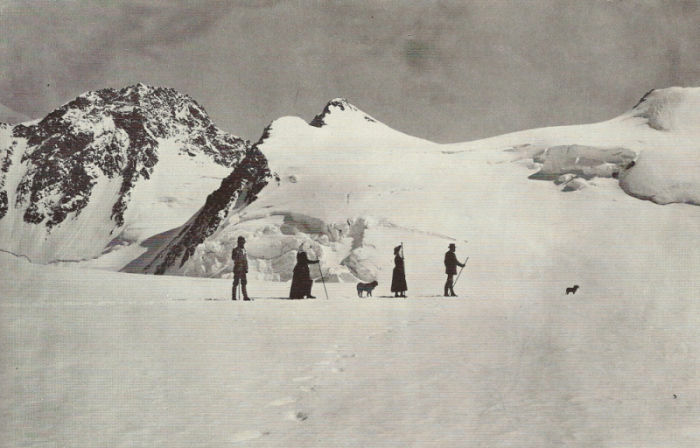 Thanks to Bora Zivkovic and the editors of Scientific American I was allowed to present A Short History of Glacier Science at the journal´s Guest Blog. Fig.1. Queen Margherita of Italy (second from left) and company climbing the Monte Rosa (4.420m) in the Italian-Swiss Alps in the year 1893. The Queen was determined to inaugurate in person a weather station on the summit of the mountain (from BAILEY 1983).